I never thought I’d be a food blogger, let alone a world traveler. But since I have found myself in a dream world being both of those things, I noticed that I have acquired a slight obsession for trying cupcakes in every city I visit. If I can’t find cupcakes, then I’ll try cookies, cake, macarons or any other confection I can get my hands on! So far, I’ve had cupcakes in Seattle (and surrounding cities), WA, Las Vegas, NV, Portland, OR, Nuremburg, Berlin, Munich & Frankfurt, Germany, Salzburg, Austria, Zurich, Switzerland, Paris, France and now London, England! I haven’t written reviews for absolutely every bakery I’ve been too, but you can read all about the places I’ve written up HERE! This past June, I went on a short excursion to London, England with my husband. Yes, just me and the husband, no kids. We left them at home in Germany with my dad who was visiting from Seattle, WA. Before we left on our trip, I knew I had to, at the very least, visit The Hummingbird Bakery… one of the most famous cupcake bakeries in London! Dave and I went to the bakeries store in Soho, since it was the closest to our hotel and easiest for us to get to! When I first walked through the door of The Hummingbird Bakery, I was immediately greeted by rows and rows of beautiful cupcakes! I squealed like a little girl in delight. A kid in a candy store? Nope, I was a food blogger in a bakery! I asked if I could take pictures and then started snapping away! I will have to say though, I was a big disappointed in the selection of flavors in their case. Although they did have the classic flavors such as vanilla and chocolate and a few others like carrot cake and black bottom cupcakes, their variety was lacking. They did, however, have an enormous amount of red velvet cupcakes and according to the sweet lady behind the counter, they are their best seller! Not only did The Hummingbird have cupcakes, but they also sold beautiful full-size layer cakes. They had at least 6 cakes on display including a surprise-inside rainbow cake! The bakery also served whoopie pies and other cookies. If I had a stomach the size of a football and the highest metabolism known to man, I would have tried one of everything. *sigh* But, I don’t… so my husband and I chose four of our favorite flavors to test! 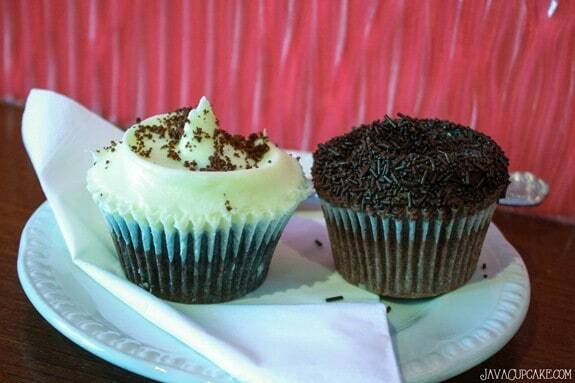 First up for sampling were the Black Bottom (left) and the Chocolate Chocolate (right) cupcakes. The Black Bottom cupcake was simply amazing. The inside of the cake part had chunks of white chocolate and cheesecake in it and was topped with a cream cheese frosting. It was perfectly moist, full of great flavor and so delicious! The chocolate chocolate cupcake was okay… not the best chocolate cupcake I’ve ever had, but I’d eat it again if someone put it in front of me. The frosting was a traditional American chocolate buttercream and was super smooth and light, which I liked. The cake itself was a bit dry, but still had good flavor. Next up was a lemon and a classic vanilla vanilla cupcake. The lemon was OMG AMAZING. The cake was moist, had great tart, lemon flavor and was topped with a tangy lemon cream cheese frosting. It was perfect. The vanilla vanilla cupcake, which I chose with pink frosting and sprinkles (because you know sprinkles makes everything better) was a great example of how a vanilla cupcake should be done. The cake was moist, the frosting wasn’t overly sweet and it actually tasted like vanilla! Overall, I enjoyed the cupcakes at The Hummingbird Bakery! I have tired a lot of cupcakes, and these definitely come close to American style cupcakes! However, they weren’t completely perfect. The cupcakes themselves were a bit small, the cake didn’t reach the top of the liners which was a bit disappointing when I paid almost $5 a cupcake. 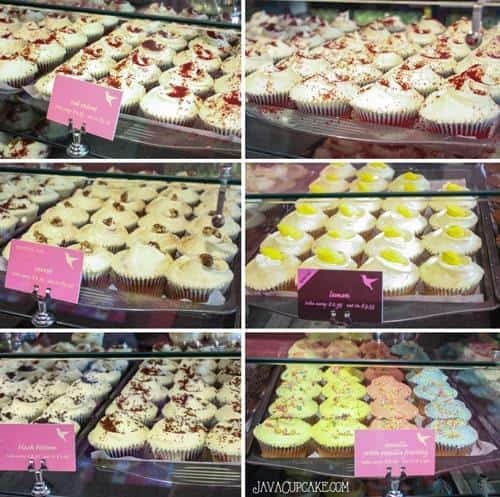 I would also liked to have seen more variety of cupcake flavors in their case, the lack of choices was a disappointment. Every Tuesday for the next three weeks, I’ll be reviewing another cupcake bakery from my trip! Next week, I’ll be reviewing Lola’s Handcrafted Cupcakes which I stumbled upon by accident in the London Underground Metro Station! 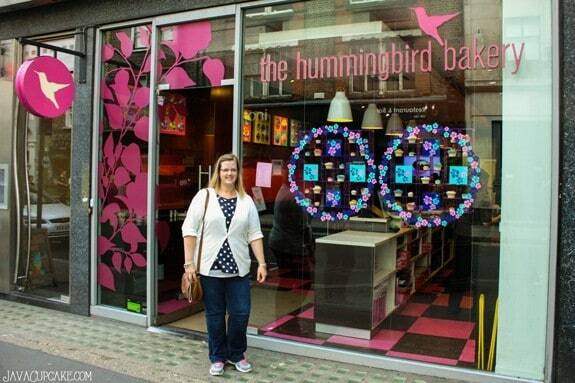 Have you been to The Hummingbird Bakery in London? I’d love to hear what you thought of their cupcakes! 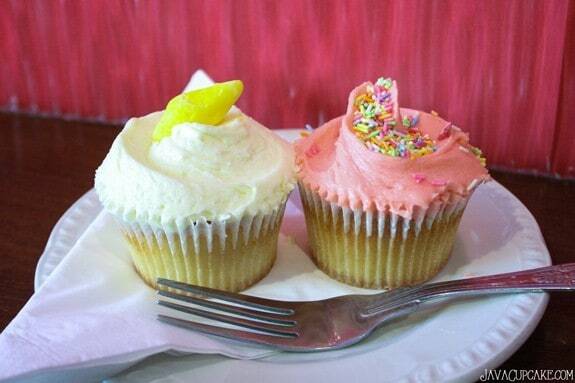 You’ve never been to one cupcake shop, ever??? 🙁 Is there one in the city you live in? I went a couple of years ago with friends. We were eigth and each one chose a cupcake and a piece of cake. Red velvet was awesome, my favourite. But i think cakes were better than cupcakes. Did you try Primrose Bakery?? Those cupcakes were delicious!!! Like small pieces of art. i couldn’t tell you my favourite one. You are really beautiful in that bavarian costume!! No… didn’t get to Primrose. I only had 2 full days in the city. Next time, I’ll stay longer so I have more time to visit them all! I’ve been to at least 1 dozen across different states in the United States, and have visited at least 10 international bakeries (but they had other sweets along with cupcakes). I used to live near London, so I would love to win this prize, since I haven’t been back in over 15 years. Ahh!! Cupcake reviews?! So fun! I’m loving the way that Black Bottom cupcake sounds. I will probably never make it anywhere overseas, so it’s fun to see this review 🙂 Keep them coming! What did you think of the cupcake shop in Nuremberg? I would love, Love, LOVE this cookbook. I love baking and will probably never get a chance to go overseas to try different bakeries. I haven’t been to very many, since I’ve only traveled to Madrid. I remember chocolate shops, but not cupcakes. However, I’d love to do that! I try cupcakes in every city I go to. Love the reviews and tales from Germany. I loved growing up in Italy and Germany. Many sweet memories. I have been to 2, one in Michigan and one in California. Not quite as exciting as Europe, but both have been winners on Cupcake Wars 🙂 and both had amazing cupcakes! Love you blog! Just came upon it last week when trying to find a great peanut butter frosting recipe. Made yours, it was so incredibly amazing! Oohh!! Did the winners live up to the hype? 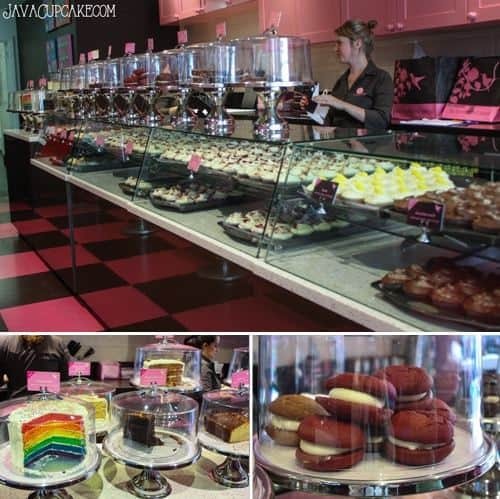 I’ve never been to a cupcake shop that was featured on CW! And I’m glad to hear you love the pb frosting recipe! It’d definitely a winner! Love the swag! Great giveaway- thanks! I tried the chocolate peanut butter whoopie pie…. but we didn’t get anything else since I was mainly there to try the cupcakes. If only my stomach was bigger! Haha! I see the whoopie pies on the counter…YUM!! So where is your next stop? I have been to Europe several times, but sadly it was before cupcakes were a big hit there. The pastries in Italy are to die for, actually everything is, pizza, pasta, CHOCOLATE, gelato, wine, bread….did I mention CHOCOLATE?? While there I made it a point to try gelato in every city I visited which now that I think about it seems somewhat silly since my husband’s family use a few gelato shops in Naples. After The Hummingbird… I went to Lola’s Cupcakes! 🙂 And yes….. I eat lots and lots of other pastries too, from all over Europe! I just don’t blog about them like I do cupcakes! And the gelato here in Germany is pretty darn delicious too!!! I’ve been to Sprinkles in Chicago. That’s the only cupcake specific bakery i’ve been too. I’m not the world traveler, so I haven’t been to that many cupcake shops. We have several great shops locally in Indianapolis and I just visited a great little shop in St. Joseph, MI during our vacation. I envy your many adventures and will look forward to your reviews! 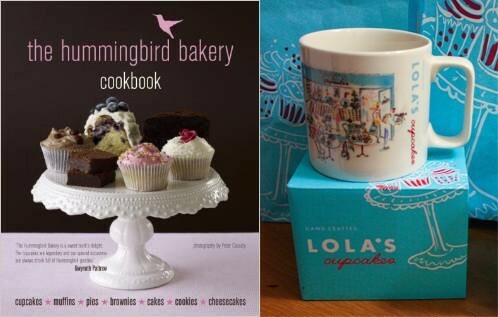 Great blog, thanks for introducing us to the Hummingbird shop. I’ve only been to one. Vanilla Cupcake Studio in Pittsburgh, PA. Sorry, it’s called vanilla pastry studio. I couldn’t find the “edit” button for all 3 comments. I apologize. I’ve been to Germany 3 times and it’s so picturesque and beautiful, right? Enjoy your world travels. Love the drindl dress!!!! What a cute shop! I’m enjoying reading your reviews. How fun to travel and enjoy cupcakes!! Also, the pics are wonderful. I have been to about 6 different cupcake bakeries. I love to try new cupcakes!!! I love visiting bakeries when I travel! I’ve only been to a couple cupcake shops though. Looks like you had a lot of fun! I’ve never been out of the USA, and I’ve only ever been to 2 cupcake bakeries, and both of them are in my town. One of my favorite things to try in a new city is the local bakeries, including cupcake bakeries. It’s interesting to see what is popular in the area! How fun!! I would say i’ve been to 25 at least. 25! Wow… I’m impressed!! Where were they located? I’ve never been to a cupcake bakery. I think we have a few in the area but neither my husband or my daughter are very big fans of baked goods (weird!). I guess I’ll have to find a friend willing to check them out with me. I have tried cupcakes from our local town cupcake shop. They were ok. Good frosting, but dry cake. The shop in a nearby town, however, has great cupcakes, both the frosting and cake are great, and they have some very creative & seasonal flavors. Sadly I have never been to any cupcake bakeries. I had the joy of spending close to a month in London in my late teens, but I was there to study English literature and history with Duke University, and the only free moment I had on my own I spent getting a tattoo! I have not been to any. I have a great family but, unfortunately at this time in our lives travel especially abroad is just not in the budget. Hopefully one day especially as a big Doctor Who fan I will make it to London! Are there any cupcake shops in your neighborhood? Have only been to a few gourmet shops in New York City! But they were worth it! I’ve only tried about 3 but I love making cupcakes! I don’t think I have ever been to a cupcake shop. I would live to take my granddaughter to one. Where is the best one around here that you would go to Besty? New York Cupcakes is my all time favorite in Washington state! Tell Lisa & Heather that you know me!!! I would LOVE to make the lemon cupcake from the cookbook! I’d make the vanilla cupcake for my husband. I think that only 4-5. Thats a pitty. I´m going to London next month and have to visit this place! Love cupcakes and making them, would adore the inpirational book to cook from and mug to drink from after sampling the results. 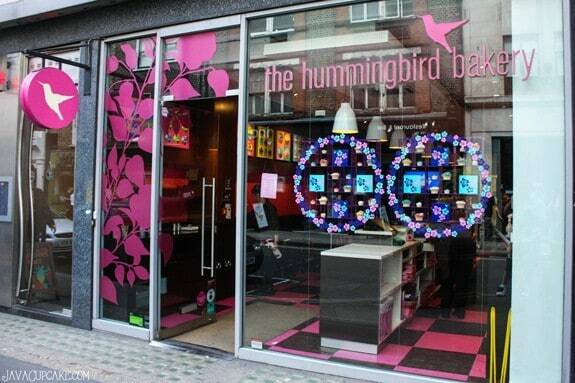 I tried the Hummingbird the last time I was in London and sadly wasn’t impressed. I had the lemon cupcake which was so sweet it hurt my teeth. Then I tried a grasshopper brownie which was nice. I have not been to any other country so done. Have you been to any in the country you live in? I’ve been to about 50 different cupcake bakeries, I try to find new ones whenever we travel. That’s amazing!! Which ones were your favorites? Off the top of my head I’ve been to Oak Mill here in Chicago… They are an ah-MAZING European bakery. My wedding cake came from there too. I’ve been to Sugar Monkey in Naperville, wonderful and so quaint. Miss Joan’s cupcakes also in Naperville, not fantastic, but good nonetheless. I fairly recently tried Just Desserts by Christine in Bolingbrook, they were pretty tasty, they’re pretty new still. I’d definitely go back. Finally I’ve been to Gigi’s Cupcakes in Savannah, GA… Not worth what we paid I think. I remember they were incredibly sweet and heavy on frosting. Where do you live, Cindy? What did you think of the shops in your neighborhood? I went to my first ever Cupcake Bakery in OKC, OK at Pinkitzel. I loved the entire store. I walked out with some Pink Lemonade Cupcakes and Chocolate Salted Carmel Cupcakes. Both were delicious! I have been to only a couple cupcake bakeries.